This Fleximounts A22 full motion (six arm) TV wall mount offers an attractive way to display a TV while also providing the most flexible viewing options. The arm can easily be adjusted, allowing you to watch your shows in a more comfortable, ergonomically correct position. 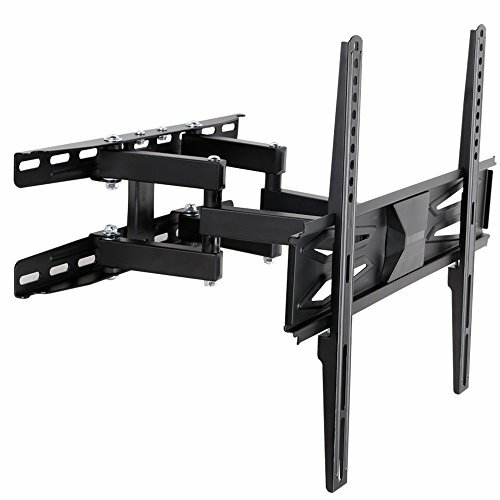 This TV wall mount can hold a flat screen TV between 32 and 55 inches with a max 400x400 VESA compatibility and 66lbs max loading capacity. This universal mount fits most TVs such as Samsung, LG, Vizio, TCL, Sharp, Sony, etc. 1. Full motion allows maximum flexibility: Extend your TV between 2.6” and 13.4” from the wall. 2. Constructed with 6 articulating arms: Well-designed six-arm structure ensures stability nearly 4 times higher than that of other brackets. 3. Universal hole pattern: Diverse hole pattern and side to side adjustment allowsthis TV wall mount to fit nearly all flat panel TVs. 4. Tilt your TV for perfect viewing: Adjust the angle in every direction for easy viewing from any seat in the room. 5. Extended articulating system: Wide-angle swivel between -45°to +45 meets different viewing needs. The TV set can be manipulated in several positions to accommodate normal TV shows, video gaming, fitness programs, video chats and more. 6. 3°horizontal adjustment：You can fix minorinstallation errors within ±3°. 7. Cable management system: Cables that would otherwise go astray can be concealed effectively making the whole TV set clean and tidy. Articulating arm TV wall mount fits 32"-60" LCD LED Plasma display; Mounting hole pattern compatible 400x400mm/400x300mm/400x200mm/300x300mm/300x200mm/200x200mm/200x100mm(16"x16"/16"x12"/16"x8"/12"x12"/12"x8"/8"x8"/8"x4"). Adjustable -5-15 degree tilt, +/- 45 degree swivel ; Retracts to 2.6"save space, extends up to 13.4" from the wall. Check your TV's Wall Mounting Size before you purchase any TV wall mount, also known as VESA Size is the mounting hole pattern on your TV back. High Quality Cold-rolled Steel material offers loading capacity to 66lbs. 4 times weight loading test,up to 264 lbs(4x66 lbs). Common hardware pack and incredible 10-Year Warranty are included in the package. View More In Television Accessories. If you have any questions about this product by FLEXIMOUNTS, contact us by completing and submitting the form below. If you are looking for a specif part number, please include it with your message.